The Omo River rises in Ethiopia’s mountainous highlands before emptying, 760 kilometres later, in Kenya’s Lake Turkana. 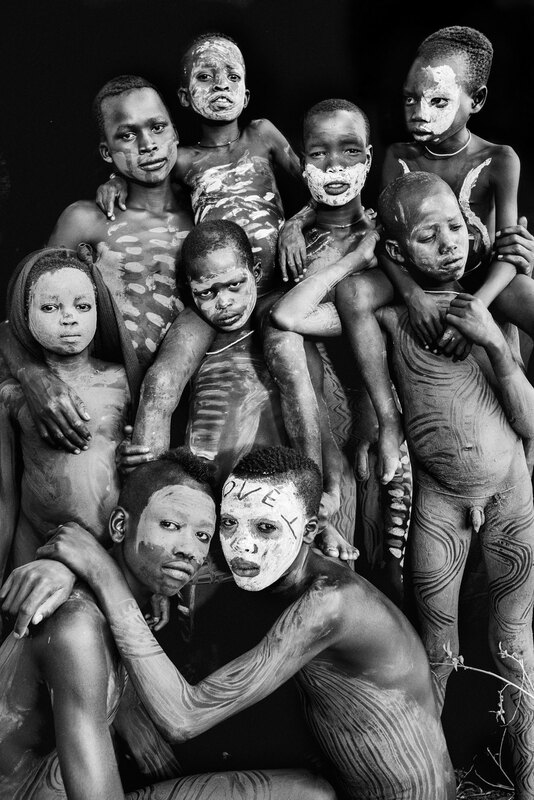 The crossroads of human migration for thousands of years, the Omo Valley has a marked diversity of inhabitants. At least 10 distinct ethnic groups occupy the borders between Kenya, South Sudan and Ethiopia and like most photographers I was drawn to the Omo Valley not by its landscape but by its people – the Hamar, the Suri, the Mursi and the Kara. Since my first visit to the valley in 2007 I have witnessed a change in both the landscape and the people, accelerated by the construction of the East African superhighway, the tourist dollar and, more than anything else, the agricultural development in the area. In the past few years, the urbanising, industrialising Ethiopian government and multinational corporations have cleared an estimated 1,350 square miles of land for commercial farms. When I first went out to the Omo Valley, I decided to photograph the people in front of a backdrop to ensure the image focused on them rather than their environment. It was a nicer experience, more inclusive, as the community would get involved in the process and I was able to photograph them on their terms. While modernisation is inevitable across the world, in the Omo it appears to be at the expense of the inhabitants. The government’s ‘villagisation’ programme, which moves people into ‘model villages’ in order to clear land for commercial farms, has been plagued with reports of human rights abuses. Barsune, Barsue, Bargon, Bargoga, Bardossa, Barcutel, Tutugo, Barcutel and Bardesho. Although the Suri are not yet subject to as many tourists as the neighbouring Mursi, it is poignant that the local guides describe those in the most-visited villages as “looking like the Mursi”, in finery that is as exotic to them as it is to us. The fate of the Omo Valley was sealed in 2006 when, upstream of the valley’s arterial Omo River, the government began constructing the ‘Pride of Ethiopia’ – the highly ambitious and controversial Gibe III hydroelectric dam. As well as allowing for large-scale commercial farming through irrigated agriculture, Gibe III stands to make Ethiopia a major energy exporter. The dam has been described as a potential humanitarian disaster for the estimated 500,000 people who live along the river and its terminal in Lake Turkana. It is thought that the agriculture enabled by the dam is expected to considerably decrease the volume of the river and therefore Lake Turkana, the largest desert lake in the world. The subsequent increase in lake salinity and the decrease in the nutrient-rich annual floods are predicted to cause food shortages, increasing the risk of armed inter-ethnic conflict over grazing land. Suri women normally make their lip plates from clay decorated with ochre and charcoal but here wood has been used. When I asked this woman why she chose an unusual material and shape, she simply said that it was because her mother had done the same. The government’s stance in the face of criticism over Gibe III’s social and environmental impact is to accuse its detractors of “patronising the national interests of Ethiopia and romanticising traditional valley lifestyles”. In the north of the country I am often told that “some sacrifices have to be made for development,” especially in a country with exponential population growth where food insecurity is part of everyday life. In many of the cultures of the Omo Valley, a girl’s lower lip is pierced around the time of puberty. The hole is initially held open by a small stick, then a wooden plug, and over time progressively larger plates are inserted in order to stretch it, as seen in this image of Achuba, a Mursi woman who I first photographed in 2009 [page 173], and again in 2013. Lip plating is an expression of beauty and adulthood but the government has been discouraging the practice. 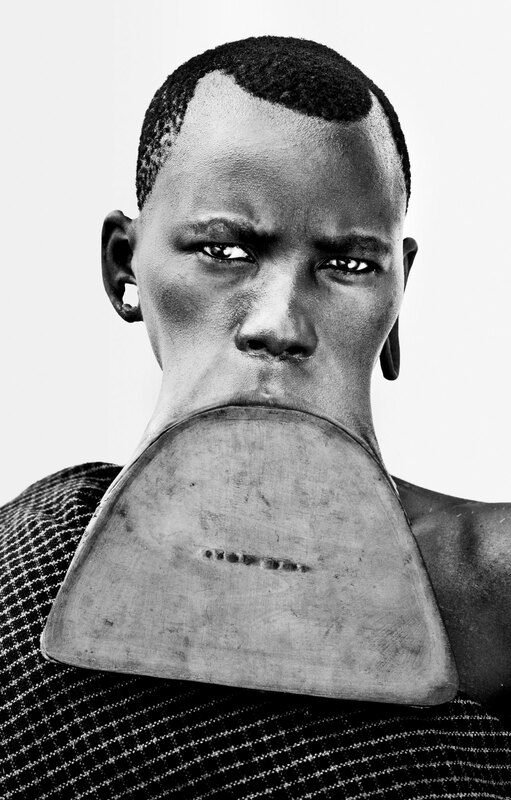 The Mursi do not always wear their lip plates – they are easily taken out and put back in. If a Mursi woman’s husband dies she will not wear a lip plate and, unless she is young and without children, it is unlikely she will wear one again. It’s often said that the larger the girl’s lip plate the higher the price the groom’s family must pay, but this is untrue as many marriages have been prearranged and the bride’s price agreed before the lip plating process starts. It is up to the girl to decide the size of her lip plate. Trade-offs in a developing nation are inevitable, but in removing the right to self-determination for the hundreds of thousands of people affected by the dam, the Ethiopian government is abusing a basic human right. The warring inhabitants of the Omo Valley, with very little formal education and no cohesive voice, are pitted against a repressive government devoid of political pluralism, with a single-minded drive for industry.